The documentary film project about fiddlers, fiddle music and the National Oldtime Fiddlers' Contest® and Festival is now TOO MANY years in the making. Filmmaker Greg Lehman is actively working on the project again in 2018 and remains as committed as ever to producing the finished film. We thank everyone for their kind and patient support. 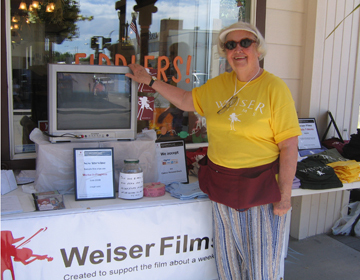 Weiser Films Volunteer Mary Lehman loves a good parade and a great T-shirt. One of the absolute highlights of the film project was the opportunity to emcee the contest in 2009 and 2010. What a blast! A huge thank you to the contest and fiddle fans. We continue to show our appreciation for the fiddle community's support and good wishes with more RECESSIONARY pricing. Click the Weiser Films Film Shop where our Weiser Films Fiddle T-Shirts are marked down ($11.99 plus $3.95 domestic S&H) for Weiser. Like to receive our Weiser Films Newsletter? Join our e-mail list (boxes, top left) and add '@weiserfilms.com' to your e-mail's 'approved sender' list. Do it now. Please tell friends about our Links page and about this site. Wishing Everyone A Great Weiser 2018!